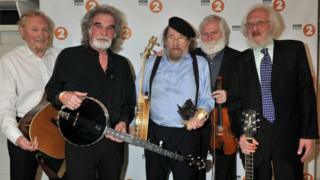 Former member of the Dubliners Eamonn Campbell has died aged 70. Mr Campbell, who was from Drogheda in the Republic of Ireland, joined some of the surviving members in forming The Dublin Legends. He died following a short illness and is thought to have been surrounded by his wife and family. Mr Campbell began playing music professionally in the 1960s and became a full-time member of the Dubliners in the 1980s. The band were instrumental in popularising Irish folk music in Europe. Their comic song of infidelity, Seven Drunken Nights, was banned in Ireland for offending religious and social mores. The ban only guaranteed the song's popularity, sending it into the UK Top 20 alongside the Beatles, The Who, The Kinks and Jimi Hendrix. Mr Campbell was also a renowned record producer, and worked with acts including Paddy Reilly, Foster and Allen and Philomena Begley. Irish President Michael D Higgins said his loss would be "deeply felt" by his family and friends. "He will also be missed by those, in Ireland and further afield, who continue to enjoy his voice and his music," he added.